Knowing how to choose, care for, and use knives correctly can make your confidence in the kitchen soar! 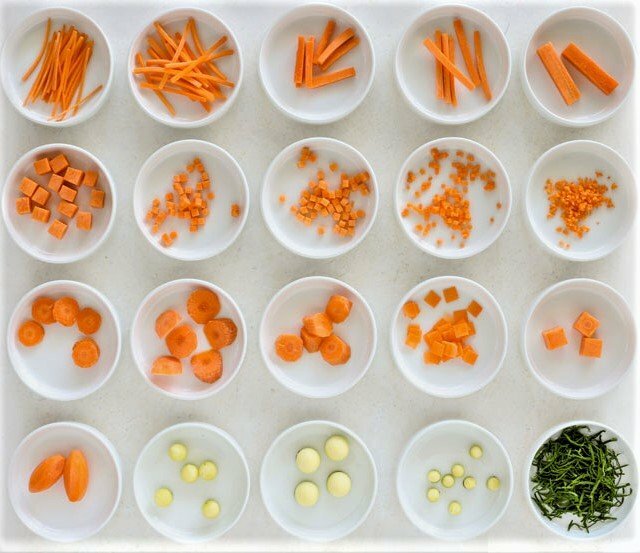 You will focus on knife skills and practice on a bunch of veggies for a salad. Meanwhile, our Chef will make and serve Shrimp Scampi Linguine for the main course so you don't go home hungry! This class is just you and knives - learning how to properly care for and hold a knife, different types of knives, then chopping, slicing, dicing, julienning, and more. You will create a Panzanella with all the ingredients that you practice your Knife Skills on. You won't make the Shrimp Scampi and linguine, but you'll see how it's done, and more importantly, you get to eat it. You'll have the opportunity to use two Asian and one European knife during class. For all Knife Skills class participants, we offer a special 25% discount on Global, Messermeister and Shun knives the day of class.